Magnetic driven HZM/HZSM pumps are designed to improve plant and personnel safety, especially when handling toxic, explosive or other dangerous liquids which react on contact with the atmosphere. For all these services the containment shell replaces double acting mechanical seals with external fluid reservoirs and the necessary control equipment. HZM/HZSM pumps therefore offer exceptional benefits to the chemical, petrochemical and allied industries and fulfill all environment protection rules. Due to the fact that 90% of pump failures are caused by leaking shaft seals, the sealless design increases reliability and reduces maintenance costs. The HZSM type is used in tank farms, for unloading rail cars and trucks, filling of storage tanks and other applications where priming of empty suction pipes is required. Considering low NPSH-values, gas handling HZSM-type offers special benefits to liquified gas applications. Typical application is filling of LPG-trucks and rail cars in refineries. In order to achieve low NPSH-value, an end suction design with an additional suction centrifugal impeller is standard. 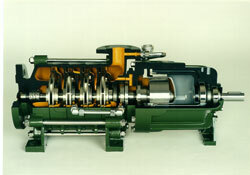 The pump shaft is driven via a permanent-magnetic coupling. The pumpage is hermetically sealed to the atmosphere by the shroud, no shaft sealing is required.